VELCRO® Brand VELSTRAP®, Facestrap, Backstrap, Cinch Straps made from 100% polyester or 100% Nylon hook and loop. This cinch strap is idea for outdoor use. Great for securing umbrellas, boat canvas, hurricane shutters, cables,hoses and much more! 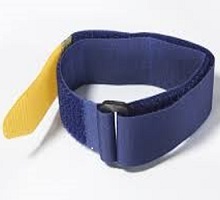 Standard widths (inches): 1, 1.5 & 2"
INDUSTRIAL WEBBING CORPORATION® Brand cinch straps 2" wide, 100% Nylon, 10 Ct.